So I thought I would point you to a couple of blog posts that have already appeared. On Emily Benet’s blog I wrote a guest post about how to create an editorial calendar. We all let the blogging slip from time to time (when book launches get in the way, for example!) but a calendar at least gives you a framework and a bank of ideas that you can call on when you’re really hit by ‘bloggers’ block’. London-based Emily Benet is a fine writer who started off blogging, before getting her first book deal. Since then her writing career has really taken off. 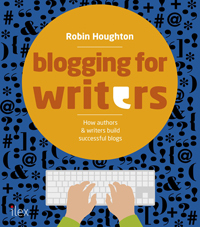 She also runs blogging workshops for writers. Here’s the post – A blogger’s best friend – the editorial calendar. Yesterday I was interviewed on Tara Tyler Talks, the busy blog of fantasy author and writer of techno-futuristic thrillers, Tara Tyler. Tara asked me all kinds of interesting questions about blogging, marketing, Twitter and more, and here are my answers – Sprucing up the blog. Tomorrow the book is getting a mention on the Facebook Page of acclaimed Scottish author Sara Sheridan, and coming up are more guest posts, interviews and reviews. I’ll keep you posted.